Hey there, I am Jenni and I blog over in a cozy little corner of "blogland" called The Roseland Family! 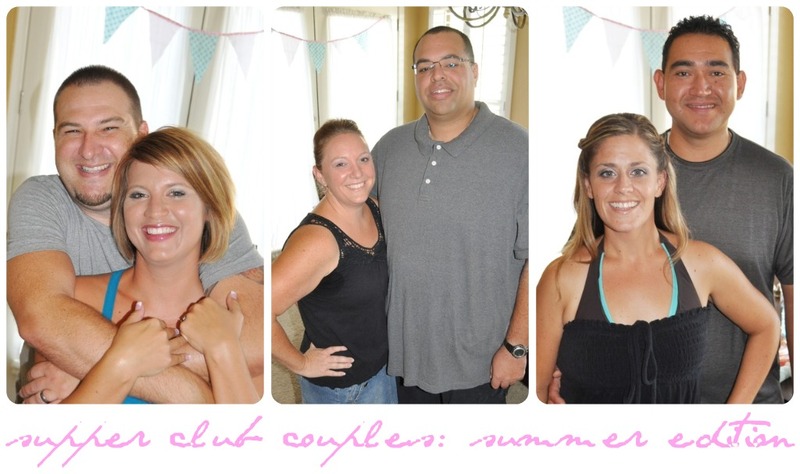 So excited to be guest posting today and getting the chance to tell you a little bit about a club that a few close friends, the hubs and I started this year: The Supper Club! It has been a great way to experience recipes that we would not necessarily ever have tried on our own (especially me, I am so picky)! After reading today, you are going to know everything you need to know about starting a Supper Club and have a year's worth of menu's planned if you don't want to take the time to figure it out on your own (which I think is sometimes the hardest part)! Last week we wrapped up our summer season and first year together planning new meals that we wouldn't necessarily try on our own at our house! This was the first time that we have been missing members of the club and Angela and Ryan were just that, very missed. With crazy schedules (especially in the summer) and new work schedules, I almost thought that the meal wasn't even going to happen! I know it won't be often, and we probably jinxed ourselves in the pool earlier this month when we were saying that we couldn't believe the weekends that we picked always worked out, but I am sure this won't be the last time that a couple will have something come up last minute that trumps supper club and be missing from the party...however, the show must go on! 2. The host comes up with the menu and then divides out the recipes to each of the Supper Club members to prepare for the party (we have four parties per year, each couple takes a season). 3. The host always provides the main dish/side dish with a variety of beverage selections. 4. Remember that it is sometimes best to semi-prepare your dishes and do last minute baking, chilling, slicing, or arranging at the home of the host. 5. Menu items should be new and adventurous. 6. Portion sizes must be small so that you have room to taste every course of the evening, so feel free to reduce recipes in half where ever you see fit. Decorating the table is not a must, but I wanted it to look perfect, I actually bought mini individual salt and pepper shakers at a flea market several months ago with The Supper Club in mind! I bought dishes (the very bottom dishes you see in the picture) on sale at Target a while back for 50% off, again with Supper Club in mind. But that was it, I only bought the plates, nothing else, so when it came time to set the table, I was stuck with what to do with them without breaking the bank. Enter my mother-in-law. I called her Saturday night and asked if she had anything "summery" I could borrow. 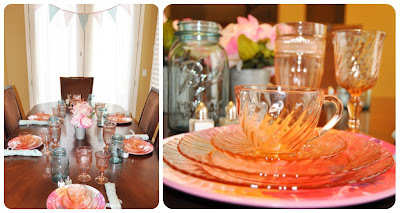 She said she had these light pink glass dishes that might work. I immediately drove over (I was actually out and about trying to find the halibut - went to three different places, it was drama, thank God for Costco is all I have to say) and fell in love! They were beautiful and I knew they would work perfect with the dishes I already bought! They were so vintage and beautiful and right up my alley! Is it bad that I don't want to give them back? Chad and I actually had an entire menu planned for about three weeks, we just hadn't assigned food to anyone yet, but we did share the menu with everyone. When Angela and Ryan announced that they weren't able to make it, we decided to change it last second to a menu that had seafood in it. You see, Angela can't eat fish anything, can't even be in the same room or she breaks out. There is always the joke, at school at least (all of us ladies of the club are 8th grade teachers), about who will get to be the one to shoot her with her epipen! Because they couldn't make this round, we thought we would throw something a little fishy into the menu. It was very delicious (although we would rather have Angela and Ryan there with us)! 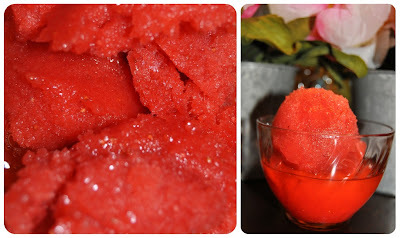 ***Click on the name of the food/drink (unless the recipe is given below) and it will take you to the recipe and everything you need to know to make your own! 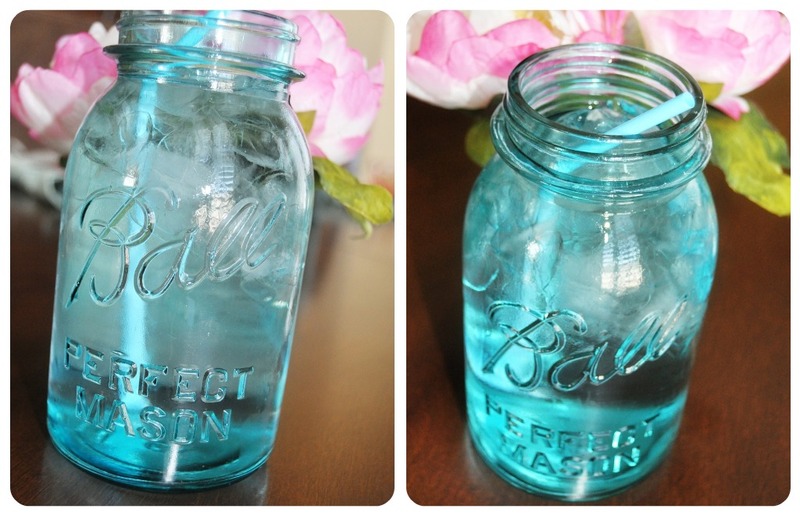 Ok, so water is always on the menu, but I love my mason jars and put them to good use! Prepare grill with foil then preheat to medium-high. Whisk mayonnaise, 2 T. oil, vinegar, sugar, salt, and cayenne together for the dressing in a bowl. Prepare shrimp and thread on skewers. Coat corn, asparagus, and bread with 3 T. oil, salt and pepper. Grill corn, turning occasionally, until kernels start to char, 10 minutes. Add asparagus and cook, turning often, until tender, 3-4 minutes. Grill bread on both sides until toasted, 1-2 minutes per side; grill the skewers. Cut off corn cobs, chop asparagus, and cube bread. Toss lettuces, cucumber, tomatoes, eggs, and basil together in a large bowl with remaining ingredients and prepared dressing. 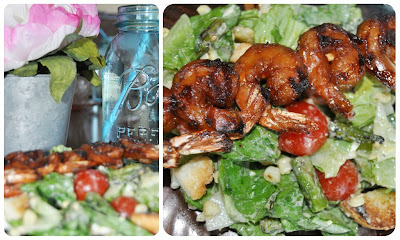 Serve shrimp skewers on top of each salad. Whisk sugar, oil, and seasonings together in a large bowl; add shrimp and toss to coat. Thread 2 shrimp onto each of 8 skewers, then grill just until opaque, 2 minutes per side. Toast pecans in a nonstick skillet over medium-high heat and set aside. Simmer sugar and water in a small saucepan over medium heat until reduced by half, about 5 minutes; stir in pecans and salt, and cook 1-2 minutes. Off heat, whisk in rum and butter (sauce will thicken upon standing; reheat gently over over low before serving). Combine oil with paprika, thyme, garlic powder, salt, and pepper (or use 3 T. purchased Cajun seasonings) n a bowl. brush mixture over the fish; grill until cooked through and fillets release easily from the grate, about 3 minutes per side. Drizzle warm sauce over fish before serving. Saute sausage in oil in a large saute pan over medium-high heat, 2-3 minutes. Add onion, celery, bell pepper, and garlic; cook until soft, 1-2 minutes. Stir in rice, saute 1 minute then add broth, bay leaf, and seasonings; bring to a boil. Reduce heat to low, cover, and simmer 25 minutes. Let stand 5 minutes, then fluff with a fork and stir in scallions. Whew, what a menu! I will say that I am not a seafood eater, at all, but this food was amazing (I find myself saying this after each and every Supper Club)! Now, aside from the drinks, it was a pretty healthy meal really too. It left us all stuffed to the max and not even thinking about that decadent dessert for well over an hour after dinner (this is a first)! But oh, that dessert, wow! So fresh and smooth and light! Perfect for a summer night out by the pool! Recipes with the * were taken from our favorite grilling magazine, Cuisine Tonight Grilling Volume 2. Unfortunately you can't link directly to their website, as they don't have all of their recipes online (which is why I typed them out). Everything that we have made from this magazine has been delicious (it is where I got hot dog recipes for our 4th of July party) and it didn't disappoint last night either! You can even purchase the magazine too if you wanted, click here (although you will have to keep checking back, as they are currently sold out right now)! Before we headed out to enjoy the pool, we attempted to get a group photo using the self timer. First time ever trying this and based on the pictures below (I like to call it our blooper reel) I think it might be our last?! After dinner there is always some sort of entertainment, usually in the form of a game. However, one of the reasons (okay, probably the reason) we chose/were chosen to host summer was because of our pool! Built in entertainment!!! It was so nice to enjoy the water with just adults for a change. No kids to chase around or watch or take to the bathroom (I love my kids, but I think you get the point)! The girls kicked it on the chairs and chatted most of the evening, as poor Kristen couldn't get her toe wet due to a nasty injury involving her nail. While the boys shot hoops and practiced their "alley ups"! Supper Club Summer was a success and I couldn't have been more happy with how the evening turned out! I can't wait for another year of trying new food! 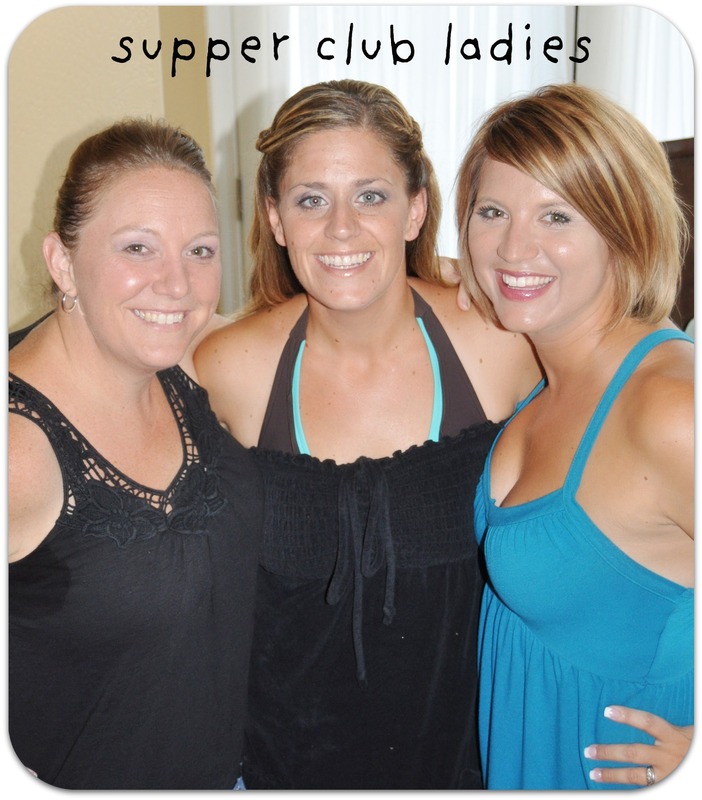 Interested in starting your own Supper Club? You read the rules and have the summer menu, but to see what we ate for fall, winter, and the spring (or to get ideas for your own), click below! To check out Fall, click here. Supper Club parties aren't the only kind of parties we like to throw over at our house though! Just recently we threw a HOT DOG party for the 4th of July! I never thought hot dogs would be such a hit! Can you guess which one was my favorite? Head on over and read the full post to find out and to see the homemade hot dog trays we ate off of! I also have a love for finding things on the cheap and fixing them up, like this night stand for my daughter's room. Check it out here for the before and after HOW TO transformation! 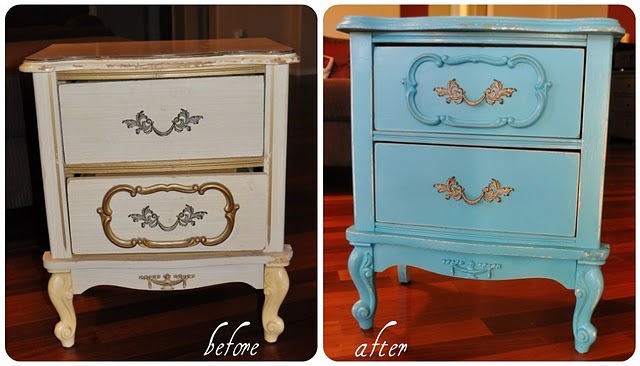 Amazing things one can do with a little can of spray paint! Thanks so much for letting me share with you a little bit of my world and what goes on over at The Roseland Family! I promise there is plenty more where that came from and would love it if you stopped over and said hello! Everything looks delicious and your table is beautiful! I love the blue mason jars and strawberry sorbet in particular :) So fun! looks like yummy fun! 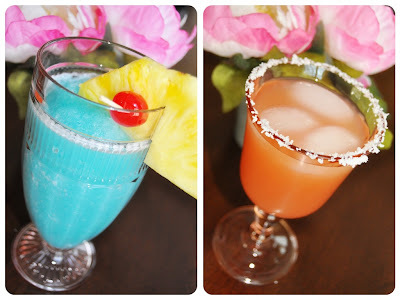 The link to the blue hawaiian drink isn't working, but I'd love the recipe! There was a strange glitch with some of the links, but I think I have them fixed now. Please let me know if you are still having problems.